Rolls-Royce is known for a lot of things, but daring technological weirdness generally isn’t one of them. That’s why it’s so surprising that they made an engine that, when described, seems like a string of the most unlikely adjectives you can link together: a Wankel with two separate rotors (but not a twin-rotor) Diesel made by Rolls-Royce. I didn’t even realize Rolls-Royce experimented with rotary engines, let alone Diesel rotary engines, but that’s exactly what they were doing in the late 1960s and early 1970s. The goal for these engines wasn’t the wildly-expensive luxury cars we normally associate the Rolls-Royce name with, but actually were for their military vehicles division. An article in the December 1970 edition of Autocar describes the engine in detail, and it’s fascinating. It’s a Wankel rotary with two rotors, but the two rotors are not co-axial as in a traditional twin-rotor engine. Instead, it’s basically like two siamesed rotary engines, one atop the other, with the lower rotor and combustion chamber significantly larger. This is because the engine is a two-stage engine, with the lower, larger rotary engine acting as a compressor for the upper engine, which is the one that actually produces power. The Wankel engine can work in place of a conventional supercharger or turbocharger to compress the air-fuel mixture because a rotary engine is inherently a positive-displacement machine—essentially, that means the intake chamber has a larger volume than the exhaust/discharge chamber, so the mixture within is compressed. In the case of the Rolls-Royce Wankel Diesel, the fuel-air mixture is first compressed by the lower rotary, and the output of that engine (which would be like the exhaust valve of a conventional rotary) sends the compressed diesel/air mixture to the intake of the smaller upper rotary engine, where it’s compressed to ignite like a regular diesel engine. 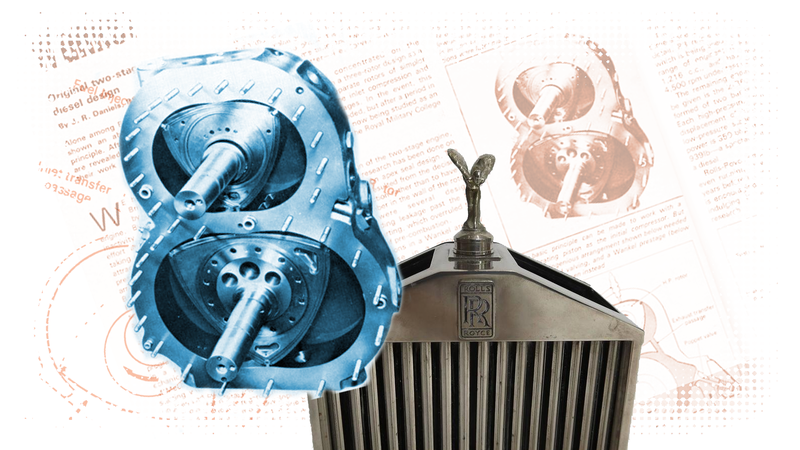 The first Rolls—Royce development engine was the R1 which was conceived purely as a research tool. With a compressor stage of 1,126 c.c., and a combustion stage of 500 c.c., it produced over 50 bhp and achieved specific fuel consumptions of better than O.5lb/bhp/hour. Among other things, it was used to develop the best inter—porting arrangement between the two stages. The R2 engine was the alternative three-stage layout, built but not investigated in detail. R3 refers to a combustion stage only, which is being used as a basic unit to build up a range of engines; it has a displacement of 1,216 c.c., and has produced 180 bhp at 4,500 rpm under test conditions. The remaining engine of which details may be given is the 2—R6. This is a military engine formed of two banks of a two—stage engine. Each high pressure (combustion) stage has a displacement of 1,265 c.c., and is fed by a low-pressure stage of 3,250 c.c. The design power is 350 bhp at 4,500 rpm, for a weight of 939lb-a spectacular power-to-weight ratio for a diesel. To minds and ears used to gasoline engines, 939 lbs for a 350 horsepower engine seems less than “spectacular,” but it looks like a modern GM Duramax V8 Diesel makes about 330 hp from around 850 lbs, so, really, for the time that is pretty damn good. Diesels need much heavier crankcases to withstand the high compression, so they tend to be heavy. It doesn’t seem like the Rolls-Royce twin-rotor Diesel Wankel actually ever made it into production, even on military vehicles, and I have no idea if Rolls ever had some engineer feverishly planning a Diesel Wankel Silver Shadow, but I really, really like to imagine it.